Tanzania begins to bury dead as ferry disaster toll hits two hundred and twenty-four – Royal Times of Nigeria. Tanzania’s Prime Minister Kassim Majaliwa has led “national funerals” on the island of Ukara where the first twelve victims have been buried after a ferry capsized on Lake Victoria, killing 224 people. Majaliwa spoke of “great mourning by the whole nation” on Sunday as the first coffins were placed in individual graves, many of the victims unidentified. 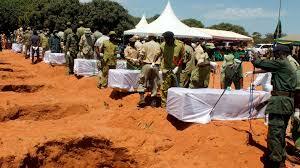 The remainder of the dead are to be buried later or taken away by families who wished to hold private funerals. Majaliwa said a memorial will be built on Ukara, where the MV Nyerere had been coming in to dock last Thursday. Hopes had faded of finding any more survivors three days after the disaster, even after rescuers pulled out an engineer on Saturday who had holed up in an air pocket in the upturned vessel. But Majaliwa said divers will continue the grim search in the waters around the boat. The ferry will also be brought back to the surface. Only 41 of the 265 people on board survived.